I recently install Ubuntu 12.04 on a older system to try it out. I will say that I was truly impressed with the functionality of this distro. First lets start with the specs of the machine I used. It was an Acer 3850 with a single core 1.86 GHz processor , 3 gigs of 666 MHz memory, and a 60 gig SSD hard drive. I also install the 64 bit version. I have been using Linux for almost a decade now and by far this is one of the best GUIs I have ever used. Once it was installed you have to setup a few things to add some creature comforts. First I had to get my wireless to work correctly. The laptop had a Broadcom wireless card so I had to install the Third party driver. Here is the syntax to install I used to install the driver. I still had a problem getting the driver to work when I rebooted the device so I had to add the modprobe b43 to the a file that I will update the name once I get the right name. Then I added Unsetting. This gives you a GUI that can be used to change certain aspects of the Unity interface. Then I added weather to the menu bar. I like to have easy access to it. This can be done with a simple command. Finally i like to have the System Monitor in the menu bars as well. You will need to install another package using apt-get. I did have to get use to the fact that you need to search the programs you are looking by using the Dash Home icon. But it is really easy to use and anyone can figure it out. However you do need to have an idea of what you are looking for. One other thing that really makes this easy to use is the Ubuntu Software Center. This makes it really easy for anyone to install applications to the OS. Installing applications on other versions of Linux is one of the problems that Windows users have. Let me put it this way, my 6 year old figured out how to use this and really likes how this OS works. Plus if Windows keeps going in the direction it is going I can see myself moving to Ubuntu as my primary OS used on my computer. Anyhow here are some must have programs that I would install to make Ubuntu a little more user friendly. First I would install VLC, everyone has heard of it and it is one of the best video players. Second would be Wine. This is a program that allow you to install some Windows programs into Linux. This works great and I use it for programs like Photofitre, which is a graphics editor. I just like using this program even though you can use Gimp. Finally I like to install some games. This would include Assault Cube, Battle for Wesnoth, and xScorch. Great for stress relief and killing time. I also like Libre Office and it works with MS Office docs so it is very functional. Plus the long term support will keep your computer patched for years to come. This may also be another way to squeeze more years out of that old computer that will not run the newer Windows versions. If you are looking to try something different you may want to try this easy to use version of Linux. I think this could be the version of Linux that has a change to really cut into the Windows market. It also runs as a LiveCD if you just want to try it. Plus it has a built in boot loader program that will allow you to easily set up a dual boot system with Windows. Give it a shot. Go to Ubuntu.com to download it. 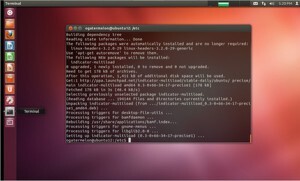 Ubuntu 12.10 is now out and it is suppose to have several improvements.